I enjoy styling my hair. Curling it, blow-drying it, flat-ironing it, etc, those are all on my hair to-do list. I am always trying and experimenting with new updo's and styles. Most people don't realize that those styles that everyone loves have to begin with a good hair brush. For that, I turn to John Frieda. The hair brushes are made all for different hair styling needs. If you need a round brush which ensures full volume, or a vent brush which helps to maximize drying time for rapid styling, they are available. Of course there are other brushes too which are there to help your hair look its best. 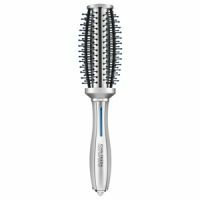 The John Frieda Vent Brush Sleek Finish is a great one that I want to focus on. This smoothing brush features silicone bristles, natural ions, and vents to maximize dryer airflow for rapid styling. This would be the perfect complement to your John Frieda full volume dryer. If you're looking to quickly style your hair in the morning before work or school, this would be the perfect brush for you. How do you regularly style your hair? 1. I will be picking ONE (1) winner for this contest. One winner will win a John Frieda® Vent Brush Sleek Finish. Winner will be chosen on August 31st, 2012 at 10 pm and then will be emailed. I blow dry it straight. I brush it and let it dry naturally with a side part. I blow it straight and then I use two flat iron to get it straight. I use a big round brush to blow dry it and style with a bug barrel curling iron. blow dry straight and either pin some back or leave down. I usually blow dry it straight and follow up with a flat iron. Thanks for hosting! I have naturally wavy hair. I blow dry it and use a brush to direct the waves the correct way. I blow my hair straight most of the time. My normal style is blow dried straight and up in a loose bun. I blow it dry and then fumble with a curling iron. I curl my hair once or twice a week and then the rest of the time I straighten my hair. I normally mousse my hair and scrunch it, but blow my bangs out straight. I blowdry with volumizing spray. Thanks for the giveaway. I wear my hair down with little curls. I comb it with a wide tooth comb and then pull it back into a ponytail. I brush out my hair and put it into a pony tail. I'm very low maintenance. I blow dry my hair, put a little wax pomade on the fly-aways and out the door I go. I usually put it up since it's really long. Sometimes I do pin ups or brush backs!